Ohnshim Kim is one of 1.8 million Koreans living in the USA, making up 0.6% of the US population. As a Korea-born U.S. citizen, she has experienced and continues to experience the reality of the Korean division and its influences. Despite the ongoing tensions between North and South Korea, she believes that peaceful reunification of the Korean Peninsula is possible. In her 2nd semester at the University of Washington, she joined the Global Peace Women Leadership Academy (GPWLA) program to help empower women to become Moral and Innovative leaders and peacebuilders in their family and community through leadership training, capacity building, and experiential service-learning. During her training, she was introduced to Global Peace Foundation’s (GPF) efforts for Korean Reunification, which explains that Korean Reunification is not just for Koreans but for the benefit of the world. This motivated her to initiate a project based on the vision of the Korean Dream and encourage others to think about how their communities are connected to the world. 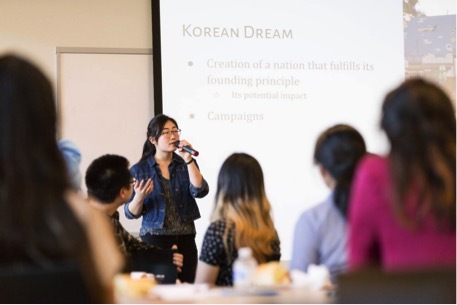 The members of Global Peace Youth at University of Washington (GPY@UW), a club initiative of Global Peace Foundation, and students from Edmonds Community College (EDCC) supported her as she initiated this project, where she was given the opportunity to share the Korean Dream with others. She organized a forum, bringing in thirty university students to combine their diverse backgrounds and abilities to expand their capacity in solving major world problems and contribute to peacebuilding. Ohnshim utilized her leadership abilities to organize the GPY meetings, tabling campaigns, and promoted her GPWLA project on social media. In these activities, student participants exposed other students to world issues and motivated them to take a lead in resolving them. As a result, a total of over 1500 people received flyers on the forum on May 2nd, under the theme Discovering Your Purpose in College: Youth Contribution to the Global Community. During the forum, Ohnshim introduced her background and shared her story, her personal perspective on the Korean division, and her efforts to contribute to making its reunification happen in the most peaceful and effective way. She then shared the Korean Dream, a vision of unifying the Korean Peninsula based on Korea’s founding principle of Hongik Ingan, meaning “to broadly benefit all of humanity. 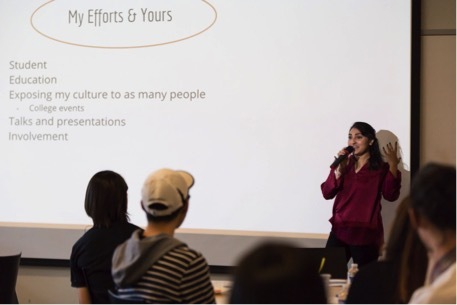 Sadia Ediaz, an invited guest speaker and student from Edmonds Community College, shared her background as a Pakistani-American, her story, and the muslim culture. She expressed her desire to positively influence her local community and people from other cultural backgrounds. After the presentations, participants were divided into groups to discuss how they could use their unique backgrounds, perspectives, and talents for global peace. One student, Andrew Hu, majoring in Education, expressed that his experience in the forum was valuable and consisted of good conversations on creating peace in the global community for young students. He discovered that no matter how different people could be because of their backgrounds, they could still have common values and interest to contribute to the community. Another participant, Sheena Gee, shared that she learned the importance of gaining new perspectives from working together. The participants expressed their desire to find more ways to contribute to world issues and plan to continue participating in meetings and projects on campus. Ohnshim was able to gain experience in collaboration and leadership skills as part of organizing the GPWLA program, but her proudest result was to be able to create an environment for students to meet new people with different backgrounds and perspectives and explore creative ways to become involved in world issues. Now a recent graduate and Global Ambassador in the 2018 International Young Leaders Assembly, Ohnshim continues to pursue the Korean Dream and inspires young people to contribute to the global community. Sign up for monthly newsletters and stay up to date on how young leaders are making a contribution to peace around the world.